We specialize in custom wrought iron hardware that cannot be found anywhere else. Our clients have the ability to choose from our exclusive hardware selection knowing that it is one of a kind. Even the rings themselves are hand made. This is just a glimpse into the many hardware selections that we offer our clients. We also posses the ability to create from scratch a truly unique type of drapery hardware for your projects from any sketch you provide to give it that lasting feeling of creativity. 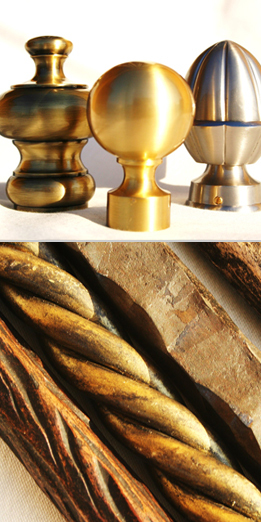 When it comes to other types of drapery hardware - we offer it all. Whether it is wood or plated, modern or traditional, we have a wide selection for you to choose from. All hardware can be custom color matched to any sample that you provide us or we can provide you with samples of finishes.